Happy Holidays from the Isle of Palms. We are now both retired and living in South Carolina. More on that in a bit. First, we wish you peace, good health and happiness for this and the New Year. What a year this has been! It started out normally enough, celebrating our birthdays with dinner at L'Ecole, the restaurant of the French Culinary Institute, which is near Beth's drawing teacher's studio. Beth learned her drawing lessons well, as you can see from this year's card. As in her class, she used colored pencil rather than her normal medium, watercolor, for our Holiday cards. Beth's mother joined us for dinner. Mike and mother commuted into NYC to meet Beth after class. They got off the PATH train at the World Trade Center and took a cab to the restaurant. We should have gotten a hint that this would not be a normal year, when an earthquake occurred on Mike's visit to his mother in February. Also, while he was on that trip to Seattle, we got an offer on our house in New Jersey. The offer may have been more earth shaking to us. We were testing the market, but did not really expect to sell this year. From the moment Mike returned, we went into task mode. It is all a blur now, but by May we had sorted, given away, garage saled, packed, loaded, moved, unloaded and unpacked 30 years of stuff. We should say partially unpacked, as there are still a "few" boxes to deal with. We moved in during the first week of June, which is typically the time of our traditional trip to Spoleto. We have been coming to Spoleto at this time of year since the early 80s. This year we didn't go back "home". It still seems like someone is going to tell us that vacation is over. Mike was still working for Lucent, a long telecommute. However, Lucent continued to have financial problems and even considered a buyout/merger with Alcatel. When Lucent offered Mike a retirement incentive, he figured he had better take it as who knew what was next for Lucent. It is still not clear what Lucent's future is. Though Mike has gone into work retirement, he has come out of running retirement. He runs most days on the beach, which is a block from the house. He even ran a race -- a 4 mile Beach Run on his "home court." Beth is still able to visit her mother only now she takes the train rather than a car. She has also been exploring (with Mike) the local sights. We spent several days at Brookgreen and only saw a fraction of the sculptures and gardens. 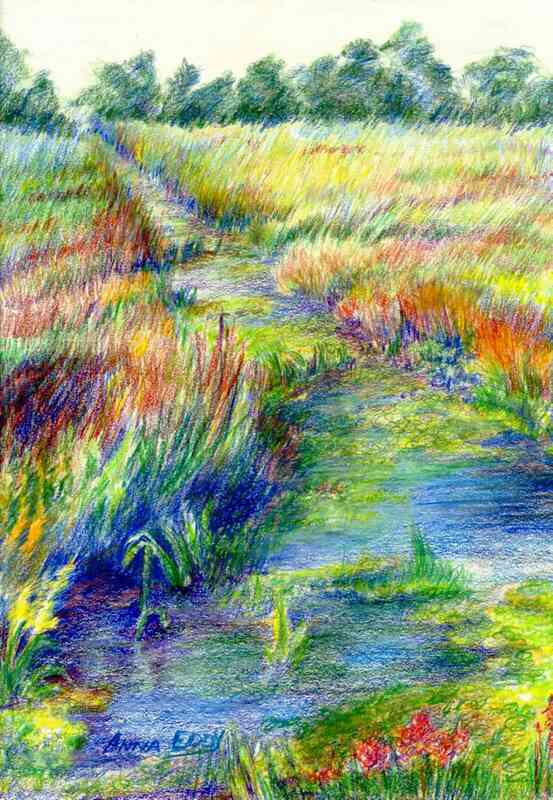 The inspiration for Beth's drawing was the rice fields at Brookgreen. When David and Carol visited us, Beth got all of us to tour the Cypress Gardens. She will tell you that the gardens were the location for part of the filming of the Patriot. When fall came, Beth had another trip planned -- to drive through the northern part of the state. The fall colors were beautiful, and we found a great place to stay, the Red Horse Inn. When we are in Charleston, there is plenty to do. Carol and Baxter stayed with us and took us to see the Hunley. They had been to the museum several times, but none of us had seen the Civil War submarine itself. Mike got to ride with Mack on his boat (not a sub) up the Intracoastal Waterway to Wilmington. It was a beautiful trip, and he is hoping that Mack invites him again. We have found the Friends Meeting here in Charleston. It is a small group that meets in the College of Charleston student center. We took part in their retreat in the late fall at a YMCA camp in McClellanville. One of the nights had a full moon and was perfect for a campfire. It had been a while since we had spent such an evening. Another of Beth's projects is architectural. We quickly realized that this house needed three things -- storage, storage and storage. Actually, we do need storage, but also a garage (which, granted, is a type of storage), and Beth needs room to do her painting. So, Beth surveyed the house and yard. She drew plan after plan. Finally, we decided to put a garage with a studio above it off the back of the house. It is connected by what used to be a screened porch. We have had fun watching it all come together. Mike's project involves a different form of architecture -- software. About the time he retired, the ADSL he had ordered before the move was turned up. He used Linux this time to develop a gateway to and firewall from the Internet. He also put up a web server to host our own web site. Now, for example, our holiday cards are on our very own server. He added a dynamic tide chart to the web site, so that he can run on the beach at low tide. Also, he added a portal of news links, which he calls our iNews. He was working on the iNews one day, when the Internet began to act very strangely. He determined that it was not our server, firewall or gateway. It was not the ADSL service. It seemed to be many, many sites having problems all over the world. He went to the TV (which is a last resort for any Internet addict) to see whether the Internet itself was having problems. Then was the first he learned of the attacks of September 11th. What a shock! Our prayers and thoughts go out to all who have lost loved ones or friends. Beth continues to make plans (travel and otherwise) for the holidays. Over Thanksgiving, we will travel together to Beth's mother's. We hope to see some of you on that trip. Beth's mother will come south for Christmas and New Years. Mike will slip away the day before New Years to Raleigh see his alma mater, Maryland, play a basketball game at North Carolina State. We hope your holidays bring you close to your families and friends. And, once again we wish you peace, good health and happiness now and always. Note: If you are viewing this letter as HTML in a browser, all the highlighted words or phases are hyperlinks to be clicked on to take you to pictures or other info.